VRM mortgage services employees have embraced the commitment of community involvement through activities within the company. Activities that promote teamwork and community support are held throughout the year. Here are the latest community-driven events that demonstrate VRM employees’ dedication to the spirit of giving. On Saturday, May 9, Seeds of Hope volunteers and their friends and family walked in the annual NAMIWalks 5K event to raise funds for education, advocacy and resources to Veterans and their families as well as the Dallas community affected by mental illness. The group proudly raised $2035 to support The Veteran Action Network, which assists veterans with critical services such as PTSD support. On April 25, 2015, PCV|VRM Seeds of Hope volunteers spent time with hundreds of other volunteers supporting Rebuilding Together of Greater Dallas for National Rebuild Day. 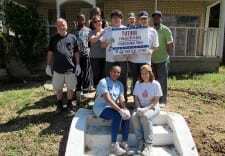 Our group helped prepare one of the first Women Veteran Transitional Homes for remodel. Donated by an elderly couple to Montrel Living, this project will address the needs of one of the most under-served segments of our military veterans by providing a safe haven for women (and their children) who are figuring out their next move in life. On Sunday, December 7, 2014, VRM employees and their friends/families met at the Garland Wal-Mart to assist the Garland Fire Fighters Association with their annual Christmas Shopping Spree. There were almost 100 children from Garland who were given $125 to help them fulfill their Christmas wishes at the store. VRM employees are proud to complete another successful year with the Salvation Army’s Angel Tree project. The needs and wishes of 125 angels will be met this year due to the generosity and efforts of employees. This year VRM employees were honored to participate in the 2nd Annual National Rebuilding Together Project. Bright and early on April 26, 2014 VRM volunteers and their friends and family met at the site of one of the last “Freed Man” communities in Dallas. This intrepid group set to work immediately painting the 130 year old church still standing but in need of much repair. The many volunteers from various companies were disbursed through the neighborhood to do minor repairs, yard maintenance and painting on a few of the homes in this historic area. VRM employees painted the church, cleaned up the curbs and repainted the house numbers. They also cleared an area at the church where they will be placing a historical building sign. VRM continued a tradition of community involvement with another successful year with the Salvation Army’s Angel Tree project. Employees, as individuals or banded together in teams, fulfilled the needs and wishes of 125 angels. VRM employees held a Can-struction competition in the month of November to collect canned food for the North Texas Food Bank. 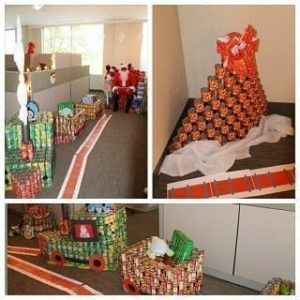 The elaborate team projects yielded more than 6000 canned and boxed food items. Through the generosity and team spirit of VRM employees, the North Texas Food Bank received 5933 pounds of food, which is estimated to provide almost 5000 meals for needy area families.